The new American Memorial Park quarter, 47th issue of the series and the second design for 2019, is soon to be in circulation. On April 30, 2019, the official launch ceremony for the new quarter design will take place in the American Memorial Park Amphitheater, which is located in Garapan, Saipan. After the ceremony, a coin exchange will be held where attendees are able to get $10 rolls of the new quarters at face value. This issue depicts an indigenous woman looking out at the Flag Circle and Court of Honor. 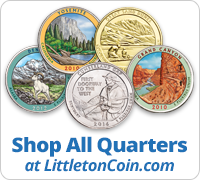 Add the new American Memorial Park quarters to your collection now. This entry was posted on April 12, 2019 and filed under 2019, 2019 National Park Quarters, American Memorial Park, Northern Mariana Islands, with these tags: 2019, American Memorial Park, American Memorial Park Amphitheater, Court of Honor, Flag Circle, Garapan, National Park Quarter, Saipan. This program celebrates revered sites and locations preserved by the U.S. Government for their natural, historical, cultural, or recreational significance.